Marty Fishman Productions recently wrapped their 3rd Feature Film! Is 50 minutes technically a feature? Maybe Hour-Long Historical Drama is a better term for the project. 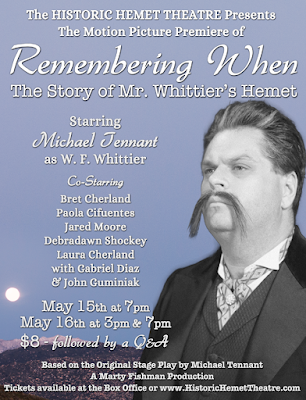 Michael Tennant's original play "Remembering When: The Story of Mr. Whittier's Hemet" was adapted for the screen by the Fishman Crew (with Wesley as Producer, Stephen as Cinematographer, Sean Longstreet as Composer, and Daniel as Director). The World Premiere was held at the Historic Hemet Theatre on May 15th, 2015. Hundreds of Citizens (mostly of the "Senior" persuasion) came out to experience this locally produced glimpse into our history. The film chronicles the early days of Hemet, all the way to Whittier's Death in 1917. 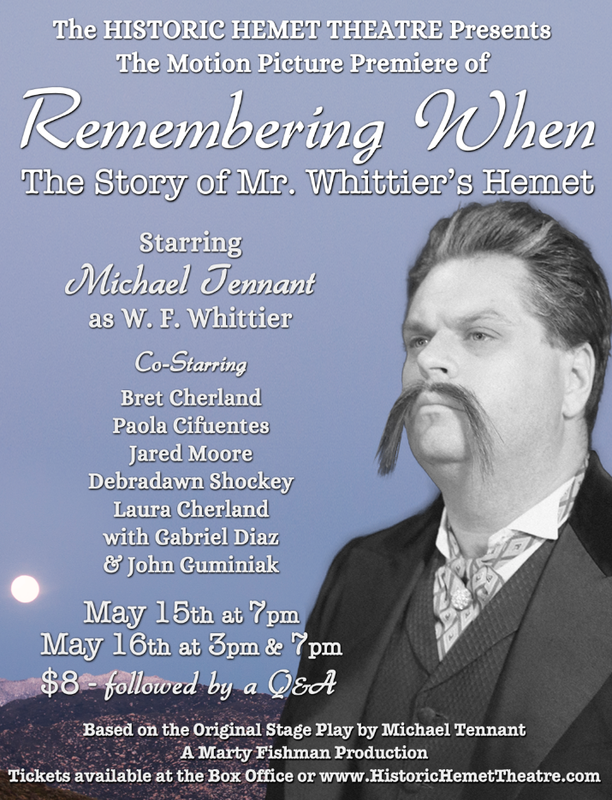 Audiences will learn about the construction of the Lake Hemet Dam, early Hemet culture, and the aspirations of the town's "first citizen" William F. Whittier (played by Tennant). DVD copies of the film can be found at the Hemet Museum and Historic Hemet Theatre.